This is not necessary to live in or even close to an oil centre like Aberdeen to work offshore in the North Sea. Aberdeen is the main place of the offshore drilling industry in the United Kingdom. It is considered the Oil Capital of Europe. It has the busiest heliport in the United Kingdom. 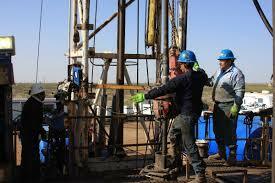 Many onshore drilling rig jobs in Aberdeen are dependant on the search for and production of oil. High proportions of current offshore employees commute from as far away as Ireland, Wales and the south of England. Others come from much further away such as Spain, USA, France, Australia etc. Among those living abroad are British people, who moved there when they became settled into their offshore career and pay their own fares back and forward every trip. Few companies now pay travelling expenses. As far as a starting salary you would be looking in the region of £20,000 per year as a Roustabout or Catering Assistant / Steward. Your payment type may vary; a fixed amount every month, or a 'day rate' where you get paid for each day on the rig. Whichever way you get paid the annual salary would still work out the same of course. There is no real age limit, it just depends on how you sell yourself. I've worked with Roustabouts in their 50's and Stewards in their 60's. You will need to be fit enough to pass the medical and carry out your duties, other than that should be no problem with age as long as you don't still want to be working offshore after you're 65!!!!! As long as you get to the heliport for your 'check in time' it does not matter where you stay during your time off. There are some exceptions to this depending on what type of job you have. For example, some maintenance personnel have to be on call to go at short notice to a rig that requires them. They are not tied to any one rig. They are sent by their employer at the request of a drilling or production company. Rig workers who have a 'back to back' and a definite period of time off the rig can usually suit themselves what they do and where they go, until they are due back to the rig.